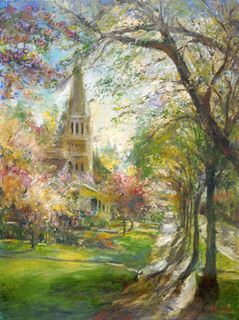 Sunday Morning| Painters Chair Fine Art in Coeur d'Alene, Idaho features original paintings, sculpture, prints and much more. Sunday Morning is a scene that strikes a chord in almost everyone who sees it. You can almost step right into the painting and experience all your senses come to life as the birds sing their praises from the trees and the spring flowers permeate the air. The church bells remind you of a simpler time as you enjoy an inspirational Sunday Morning stroll.